EPF &EPFO was established in the year of 1952 by the Government of India, this EPFO has begun to help the private and public sector employees at the time of their retirement or in future needs. 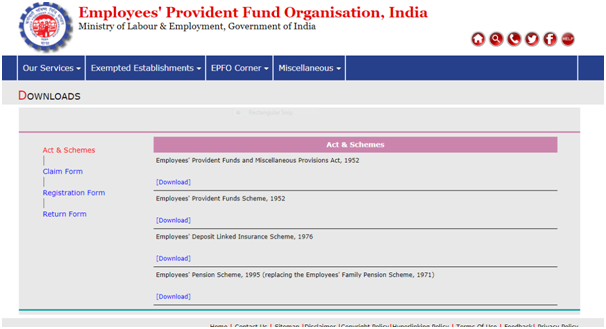 EPF or PF is also called the Employee Provident Fund. It is one where the employees can save a small portion of their salary i.e. 12% of their basic pay every month. At the same, a matching amount is contributed by the employer. Such a contribution, together, form a corpus. This is can be helpful for the employee to use this in their future needs. EPF withdrawal by employees can happen, however, be done earlier itself i.e. during their employment. taking a loan against their PF, etc. 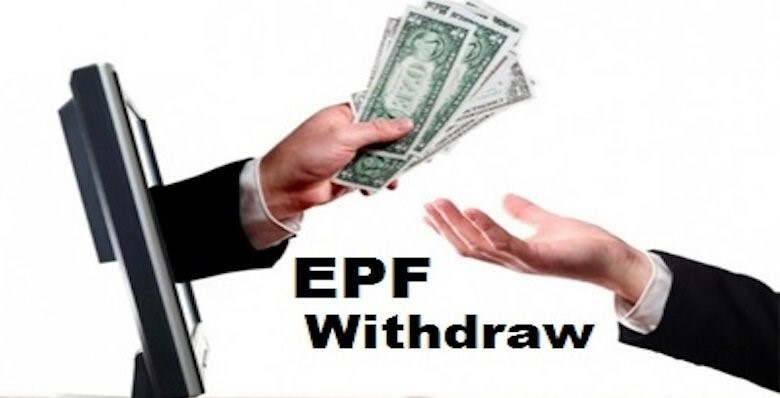 EPFO has listed PF withdrawal rules. They are as follows. After completion of 5 years of continuous service in the EPF is tax-free. Before completion of 5 years if the employee submitted his/her PAN details to the EPFO then 10% TDS (tax deducted from source) will be applicable. If in case the employee was terminated or is unemployed because of ill-health and so on, withdrawals will not attract tax. Funds transferred from one’s PF account towards the National Pension Scheme (NPS) will not under tax when one makes a withdrawal. When the employee shifts jobs and in the process has a different PF account, it will be considered as continuous service only there is no gap in contributions. Composite Claims Form used by the Employees to make a partial withdrawal or a final settlement claim. People can make the above-listed withdrawals on the EPFO member portal with the attestation of their employer if they have linked their Aadhaar card details with their UAN. With the changes made by the Employees’ Provident Fund Organization now, members need not attest of their employer to make a partial or complete withdrawal. All that the member must ensure is that his/her UAN is linked with their Aadhaar card details. The EPFO has also released the Composite Claims Form, which can be used to request for a partial or complete withdrawal. Members can easily do them withdraw by the process of making a withdrawal online either on the EPFO member portal or on the UAN portal. with the attestation of the employer, the new composite claim form (Non-Aadhaar) shall be filled and submitted to the respective EPFO office. UAN is linked with KYC i.e. Aadhaar, PAN and bank details along with the IFSC code. The KYC details should be updated. The PF member should also link his/her Aadhaar card details with their PF account. The member’s bank account details and the bank’s IFSC code must be integrated as well. Visit the EPFO member portal. Now go to the UAN portal then click on the “manage” tab and check your KYC details to ensure they are correct. Click on the “Online service” tab to proceed with the withdrawal if all the KYC details KYC details such as Aadhaar, PAN and bank details are correct and verified or not. Once the KYC details are verified then go to the tab Online Services’ in the drop-down menu select an option ‘Claim’ from’. 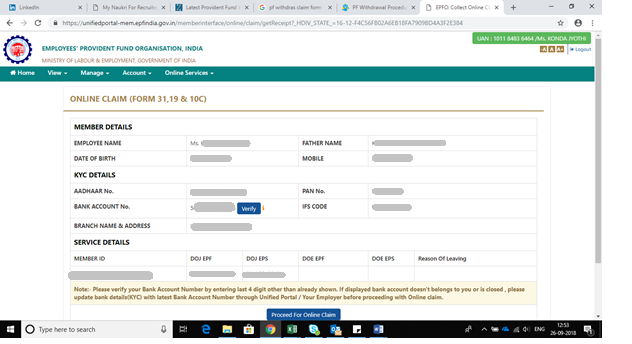 The ‘Claim’ screen will display the member details, KYC details such as Aadhar, Bank details should verify the account details which you have entered, Pan card and other service details. Click on the tab ‘Proceed for Online Claim’ tab on the claim screen that includes one’s KYC and PF details. On the “I want to apply for” option, choose the type of withdrawal you want to make -final settlement, partial withdrawal, pension withdrawal, etc. Once you select the type of claim you want to make, fill in the composite claims form and authenticate using your Aadhaar card details. you can check your claim status by clicking on the “track claim” tab Once your claim for a withdrawal or final settlement has been made. Employee changed his job and wants to transfer the account, form 13 should be applied. If an employee leaves an organization and doesn’t join another, He/she can make a PF and pension fund claim using the composite claim form (Aadhar/Non-Aadhar). If the employee above the age of 58, and has completed 10 years of eligible service, he/she can make a PF claim using the composite claim form (Aadhar/Non-Aadhar) and a pension claim using Form 10D. He/she can make PF Claim using composite claim form (Aadhar/Non-Aadhar). By using Form 10D then can make pension. -and EDLI amount with Form 5IF. -and the EDLI (Employees’ Deposit Linked Insurance) amount using Form 5IF. -and claim the EDLI amount using Form 5IF. When the employee wants to withdraw their amount there would be proper reasons to show then they can make a complete or partial withdrawal. If he/she needs to fund their house construction or pay their home loan. If they have been unemployed for a time span of more than 60 days or two months. If they wish to move permanently abroad. If a female employee is resigning their employment due to the reasons such as pregnancy, childbirth, getting married, etc. Purchase of land/purchase or construction of a house 90% of PF balance 3 years The asset i.e. land/ the house should be in the name of the employee/ spouse or Jointly. Medical treatment 6 times of his or her monthly salary or total corpus (whichever is lower) Not required The PF account holder, parents, spouse or children.